Can You Become a Professional Roulette Player? You are here: Home / Roulette News / Can You Become a Professional Roulette Player? Unlike poker or blackjack, roulette online is a game of chance and odds. 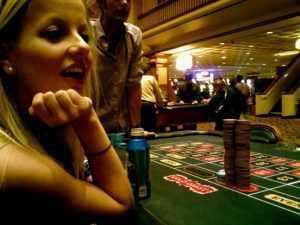 Since there is no system that a player can use to increase their odds of winning or beat the house effectively, it seems unlikely that anyone could make a living as a professional roulette player. There are, of course, plenty of gamblers whose game of choice is roulette. So how do they stick with it? First of all, roulette is one of the most popular games in the entire world. Go into any busy casino and you will find players huddled around the wheel, placing their bets. It is easy to win at the game, at least once. That initial win can lead a player to believe that they have the luck. They may win a few times, and then start believing that that have figured out the trick to success. The house always has the odds in their favor, so players cannot actually come up with a foolproof betting system for roulette online. Many players quickly discover that it is as easy to win at roulette as it is to lose. The more time that a player spends with roulette, the more they will understand about how the game works. Coming up with a personal system can give a player confidence that they have what it takes to win. In 2004, a British man named Ashley Revell made headlines worldwide when he sold off everything that he owned and bet on a single spin. It was at the Plaza Hotel and Casino in Las Vegas with his family looking on that Revell won. He had bet a whopping $135,500 USD on red, and when the ball landed in the red, he doubled his money. Despite his great luck, Revell did not go on to become a professional roulette player. Instead, he became the owner of several successful online gambling sites. Players thinking about becoming a professional roulette player should probably think again. Although it is an excellent game to take your chances on, it may not be the easiest way to make a living. Sticking to playing roulette online for fun is probably the smarter option. March Madness, Sporting or Gambling Event?